This morning the print jobs arrived at 8am, with the baggies (the last of the German order) following at 10:40. I've got all the rulebooks and box labels, and around fifty of each sheet of the game components - so I will definitely have some stock at the Expo - yeay! That was a close one for a while there. This morning I've started on the first batch of six copies - I've labelled the boxes, and I'm now cutting out the components. The Wife has mucked in and been bagging wooden pieces (the game's coinage) and numbering the rulebooks - thanks! The good news is that the boxes take less time to label than I expected, the bad that the components take more time to cut out. Still, with a couple of late nights I should still be able to take twenty or more copies to the Expo. I've got eight copies put aside for people already though, so if you want a copy to collect at the Expo, it's best to pre-order. Australia will host its second annual Euro games expo and national championships in Albury, NSW, sponsored by the world’s largest games manufacturer, Hasbro. Event organiser and Albury games store owner, Phil Davies, says this is the second year the city has hosted the championships and can’t believe the event’s growth. “We have double the number of exhibitors for the Games Expo on June 9 and 10 and we expect more than 120 competitors to register for the national titles in Settlers of Catan, Carcassonne and Diplomacy,” he says. The Expo, open to the public at the Albury Performing Arts and Convention Centre, will be a feast of games – both European and Australian – for people to try. Experts, and even game designers, will be on hand to teach first timers and provide advice. Games will also be available to buy. “Another exciting development this year is a new Blokus competition. The winner of each draw takes home a giant-sized set, and the overall tournament winner receives a $500 gift voucher from Mind Games Albury and becomes the Australian Blokus Champion” he says. Mr Davies says the Australian champions in Carcassonne and Settlers of Catan will head to the world titles in Essen, Germany, in October, while the national Diplomacy champion will represent Australia in Vancouver, Canada, in July. Sounds like it's going to be a great weekend, you'll get to meet Phil, a Hasbro games scout and compete for a chance to represent Australia. It's Alive! is proving remarkably awkward to release. First there was the Germans emailing me to say they didn't have the pieces I wanted, two weeks before the planned release at the UK Games Expo. Then my printers emailed me to tell me the lamination wasn't working as there was too much ink on the page. Then I cocked up a bunch of box trays over the weekend. The correct wooden pieces arrived on Friday, directly from the factory, so the only thing I'm waiting on from the Germans now is the baggies in which to place them. But I had been expecting the first print job last Friday. It didn't arrive yesterday, so fairly late in the afternoon I rang the printers to get an idea when it was due to arrive. They were going to ring me back. They didn't but I did get an email from the Managing Director fairly late. Apparently they had been experiencing problems with both their presses which had caused a backlog of work. They are going to send me part of all three of my print runs via overnight courier tonight, so I should get enough to make a few games on Thursday and Friday. There goes my idea of taking forty copies to the Expo. There's a chance I might have twenty copies now, but that's looking very tight. The Wife has offered to take Friday off work to give me a hand with the construction which will definitely help. That leaves me with all day off work today, and no It's Alive! construction to do - I've made forty boxes (but I can't cover them until the artwork arrives), and I've filled all the baggies I've got with wooden pieces. Instead I'm going to cut out the tiles for the Border Reivers copies I'm going to take and make some merchandising material for the Expo. I'm thinking an A3 stand for the company, plus an A4 stand for each of the two games. Over the weekend I've mostly finished the last batch of Border Reivers (I just need to cut out the tiles), and I've started making It's Alive! The delivery that I though was the first print run turned out to be the wooden pieces when I went to collect them from the depot (having not been in when the delivery was attempted). This is great as the wooden pieces were the things I was most worried about, I thought there was a real chance they wouldn't arrive on time, but they have. The down side was that when I collected the parcel I found out that the large sealed box containing 24,000 small wooden discs had been opened by customs when it entered the UK and then no-one had thought to re-seal it. The wooden pieces were loose inside the box, and the box was open. The first thing I did on arriving home was to weight it to check they were all there, and the weight was about right, so hopefully I've not lost to many. Over the weekend I've started making boxes. I drew out thirty-six boxes (to make forty as I've four boxes that the blind-playtesting prototypes went in), and then cut out the trays. At which point I realised that I'd messed them up and I had drawn them too small. D'oh! What an eejit. I've written off nine sheets of card (which fortunately doesn't cost too much and can be recycled), but more important is the time wasted. I think I'm going to aim to take thirty copies to the Expo now. Well the first print run of Archaeology is finally all produced and shipped, plus I have had some rest time (it got crazy for a little while there). I was taken a bit of guard by the number of orders I got, so I had to work quickly to construct the remaining copies. I have learnt a lot about how to speed up production for the next print run I do. Custom-made money tokens? See ya later! At any rate, I am now starting to think about the next game I'd like to do. I have plenty of prototypes to choose from. While the one I'd most like to do is called Cannonball Colony (a reasonably deep tile placement game), there are a few others that may be easier options to do next, having less components. When I get a holiday from college in a few weeks I will hopefully get the chance to start work on game number 2. I'll also be visiting the Australian Games Expo in a couple of weeks to sell Archaeology. This will be my first real convention experience, so I am not sure what to expect, but it should be great fun. I'm finally making the last batch of Border Reivers. I've made the boxes and will get most of the components plus the last batch of tile-gluing done this evening. It's been hard work and taken up a huge amount of my time over the last year, but I did it! I designed a game, playtested it, published it, manufactured it by hand and sold it. It's been a fantastic experience, that I've thoroughly enjoyed, for all my bitching about being too busy and too tired. It's Also been fun keeping track of the ratings and comments on BoardGameGeek and seeing how they've evolved. It hit a low a few months ago when one of the BBG admins rated it four (out of ten! ), but since then a few more people have rated it highly, and its now got twenty-four of the necessary thirty ratings to get it ranked on BGG. It's Alive! meanwhile is coming on, the first print job was delivered today, with the box artwork to follow on Tuesday (Monday is a public holiday here in the UK). I heard from the Germans that the wooden pieces have been shipped, and I've started making boxes for that too. I've now got seven days off work and I'm hoping to get between twenty and forty copies assembled for the Expo. The last few weeks have been a blur, but hopefully things will settle down after the Expo a bit so I can go back to having a social life (of sorts). I've now got all the print jobs off to the printers, they reckon they'll be able to deliver them in time, and the Germans think the wooden pieces will be here too. Aaaah. Huge sigh of relief. While I'm waiting for the stuff to arrive I've started the last batch of six Border Reivers games. It's strange. I've given up a huge amount of time to Border Reivers over the last five years and now I've nearly sold out of the limited edition. Feels great, but slightly weird. There's only eight copies left (so if you want one, hurry before they disappear ;-) ), and a few ordered copies that need finishing off. I estimate around twenty hours work. So there I was happily constructing the last few boxes while listening to music, about to go round to a friend's house to do the penultimate set of gluing in her backyard when I checked my email. I should know better, I know. It's the equivalent of turning round in a horror film, you know something bad is going to happen. And there it was. An email from my printers. Their laminating machine has been failing to laminate the game components - they think the ink is so thick the laminate can't adhere to the paper. D'oh. Looking at the proofs (which aren't laminated) I think it'll be alright (and in fact I've been recommended not to laminate components by Markus of JKLM Games as it eventually peels off), so I've told them to go ahead without it. Still, this game has not run smoothly, what with the Germans and all. Still, orders are still trickling in, and it's not even out yet, so there's no work of mouth or real content on The Geek yet. I might have everything ready in time fo the UK Games Expo! After a couple of slightly panicked phone calls to Germany where their English completely showed up my German yet again, I got an email from my German suppliers telling me that I should have the wooden pieces for It's Alive! by next Thursday. Which is cutting it a bit fine, but would be alright. Dave has also made a pill counter for me, which will allow me to quickly sort out the correct number of wooden pieces for a game - speeding up the sorting and bagging process. The Germans are going to ship to me from the production facility (rather than the office) which will speed up delivery. In other news, two of the print jobs are now with the printers: the components which will hopefully arrive on Friday and the box labels, which are due next Tuesday. The third and final print job - the rules - will be sent tonight and should arrive next Tuesday or Wednesday. I'm getting the rules pre-cut and folded, so I'll have very little to do for them - just numbering and slipping in the box. It's all very exciting, but it's completely un-sustainable. I'm finishing between 12:30 and 1am (last night I got to bed at 12:15! Early night! ), and then it's taking me about half an hour to relax enough to go to sleep. This week The Wife is away, and I miss her, but the silver lining is that I get to use the car, and hence I can get up later and still get to work at a sensible time. By later I mean 7am though - so I'm getting nowhere near enough sleep. I feel shattered pretty much all of the time. My parents were up at the weekend, so that meant slightly earlier nights and a proper lie-in which was nice. It's fun. But very hard work, especially when you have to fit it around a real job. 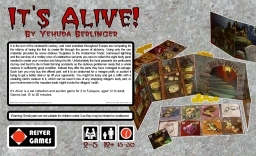 I've ordered the wooden pieces for It's Alive! from a supplier in Germany who provided the pieces for Border Reivers. When I ordered them two weeks ago I was told they would arrive in the third week of May - i.e. next week. Last night, after close of business in Germany I received an email which told me that the pieces I wanted are not available - please can I order something else. I have two weeks until I hope to release at the UK Games Expo. Aaaaarrggh! Try to sort out plastic pieces instead. I'm not liking any of these options much, but I think the hour before I start work on Monday is going to be a busy one. God knows whether I'll have a product in time for the Expo. Yesterday I received the proofs of the first print run from the printer. The first print job is the cards, player shields, player guides and slabs - basically all of the game components. The artwork looked really good, a little darker than I expected but not really a problem. There was a problem however. I've been exhausted the last couple of weeks, I'm up until around 12 - 1am working on the It's Alive! graphic design, and then have to get up at 6:30am to get the bus to work. I'm wrecked, and it told in the artwork. I'd accidently left crop marks on both sides of the artwork, and I'd done the wrong sort of crop marks on the cards. D'oh! My printers will accept amendments to the artwork, but it costs £24 + VAT to re-submit new artwork. Sadly, I had to do it. Still, the good news was that it gave me a chance to tweak the player guides to make them more legible. £28.20 over a run of three hundred games is less than 10p added to the cost of a game so that's not a major problem - plus I'd left a little slack in the budget in case of emergencies. Gtting the components proof back from the printer also means I can mock up a game for the back of the box photo. All the artwork is one-sided so that added a challenge to the framing of the photo, but The Wife came up with something nice. I'm sending the second print job (box labels) off tonight. And the back. As usual, you can click on the images to see a larger version. Sorry it's been so quite here recently, I've been exceptionally busy. I've been trying to get the last few copies of Border Reivers constructed for the Beer and Pretzels convention, while preparing prototypes of It's Alive! for the playtesting and trying to get the artwork ready for the printers. I spent the last weekend in Burton-on-Trent at the Beer and Pretzels convention organised by Spirit Games. Due to the presence of an all day bar the beer was both plentiful and high quality (Burton has five breweries), and I noticed several people had brought Pretzels, so the convention was aptly named. I had managed to get seven finished copies to take with me (mostly by stealing sets of tiles from ordered copies that weren't needed any time soon). I was hoping for three sales, more than three would be great. It was the largest convention I had been to, and it wasn't just limited to board games - there were wargamers, CCGs and roleplayers there too. Phil set me up with a table just outside the bar (and between the entrance and the bar), which was a great location. Plenty of traffic wandering past. I was set up opposite a table where someone (presumably the designer) was showing a professionally produced game called Fondue about cheese chasing. It looked like a mainstream (toy shops not game stores) game, but the guy left before I had a chance to speak to him. One of the things I was worried about was that I might have saturated the market - that everyone who was interested in buying a copy of Border Reivers would already have one. I knew that a few of my customers would be there - was there going to be anyone else interested? Fortunately, yes! Saturday got off to a great start as I set up a 4-player game with Acer, Charles and Dave. The guys quickly got stuck in and we had a great game which was won by Dave. At the end of the game both Charles and Dave were interested in buying a copy, but it was out of Dave's budget, so Charles bought one instead. Good start ot the weekend. My next game was with Tim who had played in Stoke a few times with the various members of Shire Gamers who own a copy. As is often the case in a 2-player, my experience told and I won the game, but Tim enjoyed it and is up for playing it again in Stoke. At some point a guy called Peter wandered past, and after a brief chat bought a copy on spec. This day was going better and better. I had two more 2-player games on Saturday, one with Matthew and one with Neil. I won both. Matthew had some dreadful luck on the reinforcement rolls and clearly didn't enjoy the game, but Neil and I had a great game, and he ordered a copy too - that will be my three sales when his cheque arrives. A great day from a sales point of view. While looking for a game to play I bumped into Ben, who had bought a copy at The Cast Are Dice last year, and his good lady. They suggested a game of Evo, and Matthew and Ian joined us for a 5-player. Something about this game didn't agree with me. I don't know whether it was the numerous dice rolls or what, because the theme and cartoony graphics are right up my street, but I didn't get on with it. I also got royally creamed. After an hour or so I drew a card that gave me an opportunity to potentially do a lot of damage to the other players, at the risk of being eliminated myself. That didn't strike me as a problem, so I went for it. I died. Poor old Ben was the only other player to suffer really. I wandered off at that point. I've no idea who won. Then I sought out Steve, another of my TCAD customers from last year. He had a copy of 'my mate Phil's' game: Archaeology which I was keen to try out. I had thought to buy a copy, but before I had a chance, Phil had sold out! Anyway, Steve had played it a bunch of times and was quite keen on it, so I definitely wanted a game. That evening Steve and I played a couple of games of It's Alive! and one of Archaeology. Steve enjoyed It's Alive! and ordered a copy, and I enjoyed Archaeology. It's nice, simple, quick and clean. And the production quality is fantastic. Well done, Phil! I'll post again with Day Two in a few days. The interview I did for the Yorkshire Post has finally been printed today. It's a nice interview (software expert :-) ) and has a massive photo on page three of the paper. The Yorkshire Post is a cross between a local and a national paper and already it's having an effect. I've had two orders today from Yorkshire (which I guess are as a result of the story) and both local radio and TV stations are interested in running the story. That's a great result as far as I'm concerned, and it may go further yet! 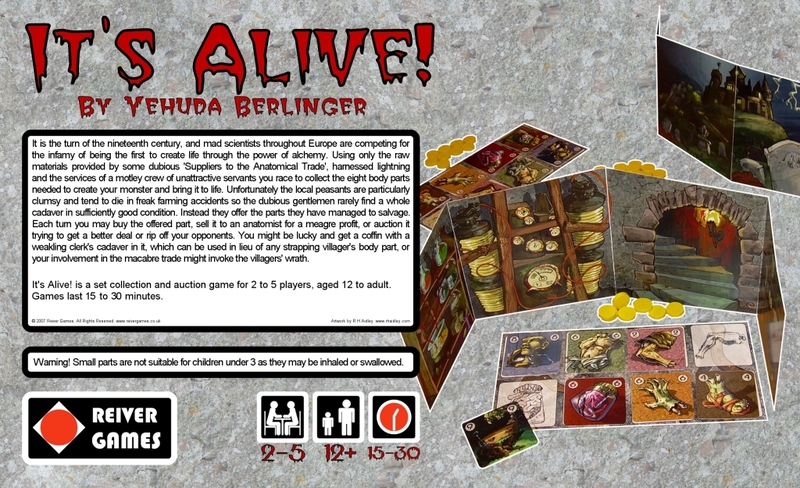 This evening I held the blind playtesting session for It's Alive! in a local pub. I'd invited a few friends and some people from the local games club. It was a great night. It's Alive! was played probably around twelve times in total with 2 to 5 players. It was a fun evening. As with Border Reivers, before the playtesting I got last minute nerves and was worried the money I'd already invested was a false economy, but I'm now full of confidence again. I've not had a chance to fully digest the feedback, but it's clear that the clarity of the rules is the weakness again, I need to make sure they are more clearly explained. Clearly I've still got stuff to learn about games publishing, but I feel I've learnt a lot in the last year, and I hope it shows in the selection and production of It's Alive! 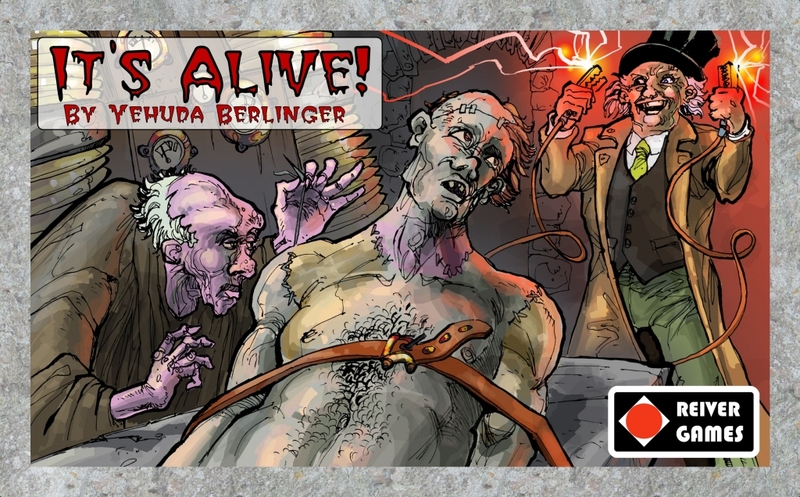 I've booked a blind-playtesting event for It's Alive! next week. It will be in the upstairs room of the Yorkshire Terrier pub on Stonegate in York next Wednesday (9th May) from 7pm until 11pm. Click here for a map. The event is limited to twenty people, and to people who haven't yet played It's Alive! You'll get to play the game from the rulebook, without any help from me, and drink great beer. At the end I'd like you to fill in a short questionnaire, and provide feedback on how to improve the quality/clarity of the rules. In return for your time you'll be able to order a copy at the playtesters discount (20%), so £12 instead of the usual price of £15. If you would like to attend please email me to book a place. After my GeekList last week things have been pretty hectic round here. I've finally (nearly midnight last night) completed the copies I needed to fulfill all the sales I've made during the last couple of weeks. I now have a grand total of zero complete copies in stock. In nine days I'll be attending Beers and Pretzels in Burton-on-Trent. Obviously I need some stock for that, so I've got lots of Border Reivers construction ahead of me. Still, I've got ten copies ready apart from the tiles so I should be able to get a bunch done in time. 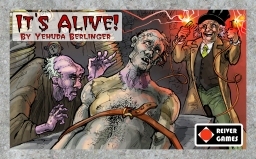 In addition, I've received the last of the artwork for It's Alive! from the artist and sent him payment, and ordered the wooden pieces from Germany too. On top of that I have to get the graphic design work done on top of the artwork. I've got to come up with a way to display the numbers of the cards on top of the artwork without looking crap, do the player guides, and make the rules pretty. I'm trying to organise a blind-playtesting event, and I think I've got about three weeks before the artwork has to be complete. Aaaah! Off Topic:A further complication has been due to some health problems. Last year I experienced some wierdness where one of my legs went partially numb. Odd. I went to the doctor and was sent to a neurologist who sent me for an MRI scan. Still, it wasn't bothering me that much, it didn't stop me doing anything, and the neurologist thought it was most likely a virus causing an inflamation of my spinal column. About six weeks ago, I experienced some new symptoms. First my balance (which had been a little dubious) got significantly worse, and then I developed double vision. Over the last month or so I've been busy. I've been to A&E, the Eye Clinic twice, my doctor and now the neurologist. Three weeks ago I had an appointment with the neurologist to give me the results of my MRI, and my new symptoms confirmed the MRI results: I have MS. In the short term, this isn't too much of a problem - and shouldn't interfere too much with either my life, Reiver Games, or my job, and the double vision has now repaired - which is good as I couldn't drive for a few weeks. But things will get worse over the next few decades, and it's incurable. D'oh. If you're feeling charitable, please give generously to either The MS Society (UK), the The National MS Society (US) or a similar organisation in your country to help scientists find a cure or ameliorating drugs. Ta!